Affordable smartphone options aren’t lacking in the Philippines, with brands like Huawei, Oppo, and Vivo’s aggressive efforts to satisfy the needs of the market. Yet Chinese electronics brand Xiaomi isn’t fazed by competition. After two years, it finally returns to the Philippines offering their new, and affordable gadgets, with TriNoma being home to its first branch. In 2010, entrepreneur Lei Jun founded Xiaomi with the belief that high-quality gadgets need not be costly. Since then, the brand has been creating quality technology that’s affordable, and already has more than 100 million products sold in 2016—and is still continuing its expansion worldwide. It’s currently present not just in Asia—Taiwan, Hong Kong, Philippines, India, and Indonesia—but also in Brazil. Just this March at China’s annual legislative session in Beijing, CEO Lei Jun announced the possible expansion of Xiaomi in the United States (US) within the year or by early 2019. Some of the brand’s accessories such as power banks and Bluetooth speakers are already available in the US. In 2015, after the launch of their Mi 4i smartphone, Xiaomi ceased operations in the Philippines. This was just a year after they first launched here. Xiaomi then channeled its business to India, which eventually catapulted them to new heights of success. From just a thousand employees, it now has a workforce of 10,000—and is eyeing to penetrate even more Southeast Asian countries. Its official launch in the Philippines is a partnership with Grimalkin Corporation. From just online selling in Lazada last 2014, Xiaomi has remodeled its customer approach by setting up physical stores in locations such as in Trinoma Mall and SM Megamall, so consumers can see and try their products firsthand. Aside from smartphones, the store also sells televisions, power banks, headphones, wearables, backpacks, and shoes, among other products. There are also appliances like desk lamps and vacuum robot air units for sale. After the positive reception of Xiaomi by the Filipinos, there’s a big possibility that the brand will expand its operations to large cities in other parts of the Philippines, like Cebu and Davao. 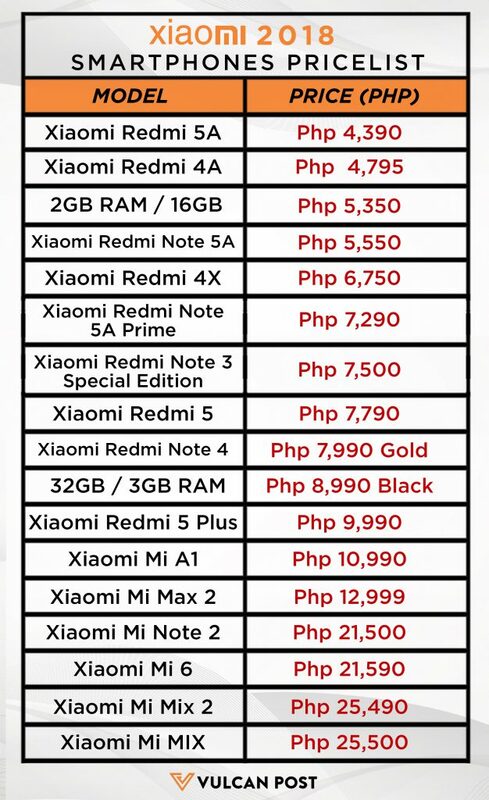 Xiaomi’s leading smartphone product is the Redmi 5A, with a price of Php 4,590. It has a 13MP camera, a Qualcomm Snapdragon 425 processor, two 4g nano SIM, a 128GB microSD card, and a 3000mAh battery that can last up to eight days. It comes in three colors: dark grey, gold, and rose gold. Another popular model of theirs is the Xiaomi Mi A1 which has a 5.5-inch Full HD Display, an Octa-core Qualcomm Snapdragon 625 Processor, a 12MP dual front camera with dual LED flash, a 5MP front camera, dual SIM, and a fingerprint sensor. This model also comes in three colors: black, gold, and rose gold. 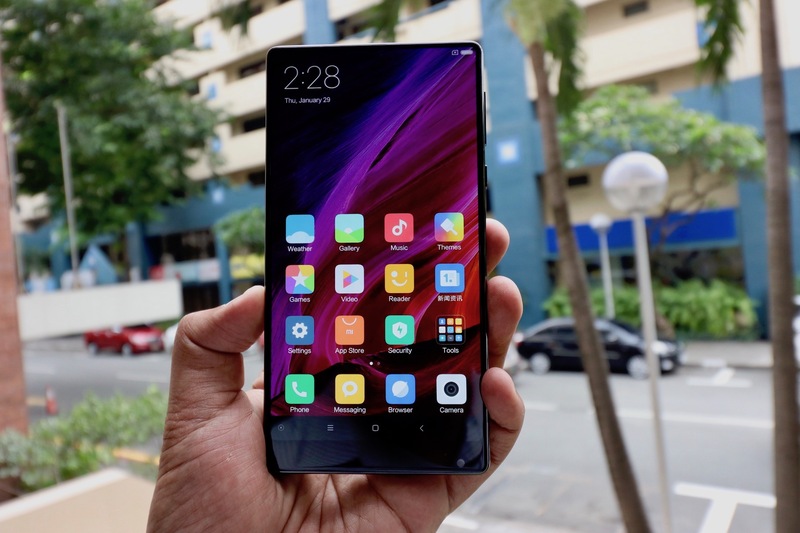 With the affordable smartphone offerings of Xiaomi that appeals to the budget-conscious Filipino nation, it will not be a surprise if the brand will eventually take hold of a big chunk of the consumer pie. But really, if there’s a winner here, it’s the average Filipino who just keeps on getting more and more options of gadgets to choose from.